What do you call a monkey who loves potato chips? Monkeys live in groups, known as troops. They express affection and pacify others by grooming each other. Will it not be nice to get a personal groomer for valentine day. 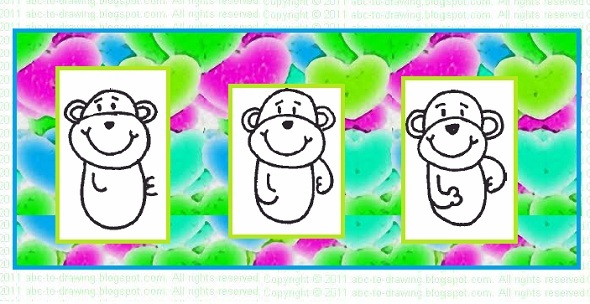 Lets draw our sweet valentine monkey card. Write an upside down U on top of O. Write two C, one should be turned around for ears. Write two similar but smaller Cs inside the big ones to finish making ears. Write small V to start making nose. Make eyebrows by writing two horizontal I. Finish nose by joining tips of V with I. Color it black. Make a big smile by writing a big U and then make dimples by writing two small U at each end of big U. Make body by writing a huge U as in last figure. Write a turned around J to start making one arm. Write turned around 3 for the second hand. Write small U mid way on the left side of big U that was for body . Write turned around C joining lower end of 3 to finish making second hand. To make legs we write four 1, inner two a little longer than outer two. Make tail by writing 6. Finish making feet by writing C joining outer and inner 1. You can make your monkey hold anything you like. Mine is holding a balloon and a heart. You can change the shape of tail by writing S instead of 6. 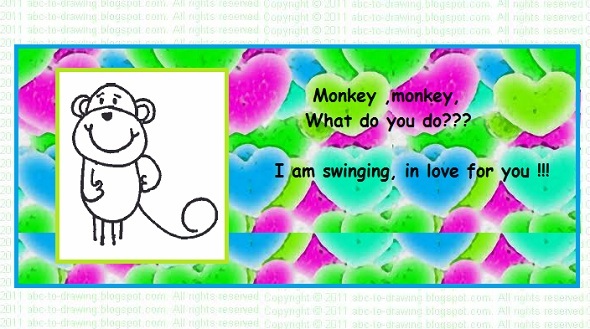 What did the boy monkey say to the girl monkey on Valentine's Day? 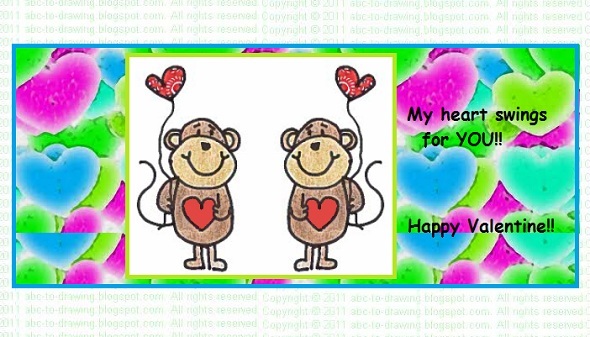 I am sure you have your own troop to hang around with for a wonderful valentine party!! Great and simple!!! Nice drawing with easy tips for kids to learn.